Teaching with TLC: Make a paper book without glue, tape or staples! Make a paper book without glue, tape or staples! Today my kids were writing adventure stories so I decided to try something different. Instead of having them write their stories on regular writing paper, we created books without any glue, tape, or staples. Yes, it is possible! I found this tutorial on You-Tube on how to make a simple book with only a sheet of paper and scissors. Instead of using a standard size sheet of paper like in the video, we used a large sheet of construction paper to make bigger and thicker pages. The kids thought it was very cool! They even spent extra time on their stories, which turned out wonderful! See how a different approach to teaching can spice up learning? I just love that! 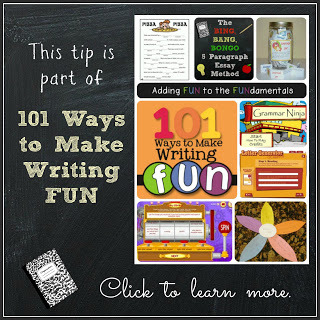 This writing assignment is part of 101 Ways to Make Writing FUN!